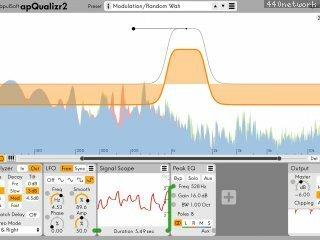 apQualizr2’s filters are based on a unique method to match ideal frequency response curves over the entire frequency spectrum while maintaining minimal latency. Applicable filter types have adjustable steepness (adjustable number of poles) and can be individually switched to Mid-Side processing. - High quality minimal latency vari-slope filters modelled perfectly over the full frequency spectrum. - Graphical editing of filter parameters. - Unlimited number of filter bands. 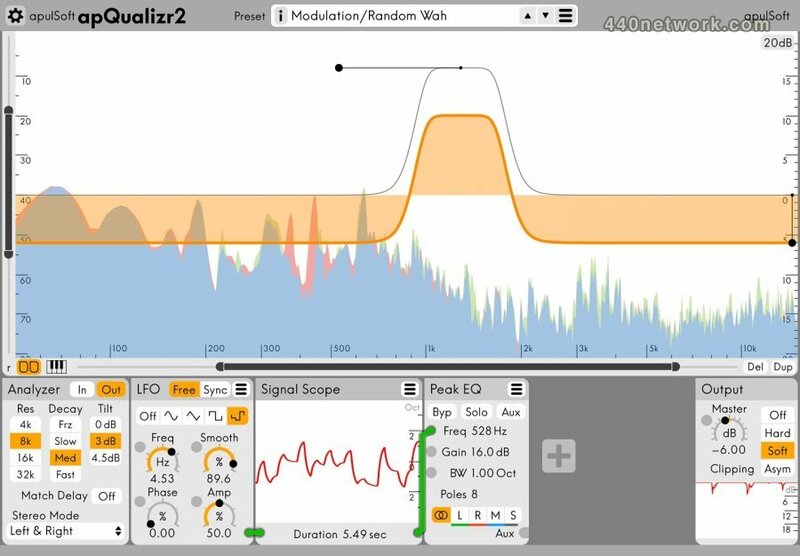 - Zoomable FFT-based frequency analyzer displayed beneath the filter curves. - Frequency band solo feature: hold Alt to solo frequencies in mouse proximity at any time. - Filter parameters can be modulated by a configurable network of modules. - Current module selection: LFO, Dynamics Detector, Signal Scope, Mix, Split. - Mid-Side / Left-Right processing per filter band. - Output clipper with gain reduction graph. �� Switchable color schemes. Switchable in preferences. �� Optional Frequency/Gain grid. Switchable in preferences. �� BUGFIX: The master gain handle on the main display didn’t show modu- lation correctly. �� BUGFIX: The Mix module amp factor only worked for integer factors. �� BUGFIX: One pole low- and highpass filters were producing weird re- sponses for negative gains. �� BUGFIX: Crash after removing the plugin from the host while the GUI is open. �� BUGFIX: Incompatibility with some OS X intel VST hosts. �� apEQ is now compatible with the fxpansion vst2r tas wrapper. �� New way of authorizing apEQ (workaround for problems with Logic 8). �� Added saving a default init preset. �� Added zoom to the analyzer and the filter display. �� Doubled the FFT resolutions. �� Improved handle appearance and behaviour for filters outside the viewed area. �� Improved analyzer calculations to produce a more steady cpu load. �� Improved the downsampling filter of the 4x oversampler. �� Faster analyzer graph drawing. �� BUGFIX: Notch filters drew wrong if they were outside the viewed area. �� BUGFIX: The mousewheel did not work on windows. �� BUGFIX: Preset names did not show up in Digital Performer.